Unfortunately, I demonstrated a bit of the last at my piano lesson. I think I'm past the point where practicing in class is enough to keep me moving forward. This week I'm going to start making a habit. What to try... Maybe 15 minutes before (or perhaps with) my first coffee. In other news, I swapped my first loaner cello for another today. 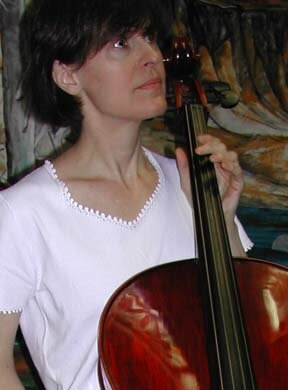 The first was a modern cello (2006) by a local maker. It was fun listening to it get better and better as I played it, but it did have days where the wolves on open G or A were very annoying. On some days I considered trading in my future replacement cello and buying it, but it just didn't have the same appeal as my deceased cello. The new loaner is a completely different animal, an old (old) French cello. I've just finished my first practice hour with it, and I can tell we are going to have a lovely time together. A very rich and even sound, which I like, but a little "harder" to get the sound out. I can't wait to hear it at orchestra rehearsals tonight and tomorrow night. No lesson or trio until next week, but that will give me more time to adjust. John gave his seal of approval, immediately coming to my side during Elegie, and staying for several passes through Chanson Triste. I really think he is developing some musical sophistication. He waited patiently while I was playing, but butting against my arm at each cadence. I wish my ear was so good! That sign is going to look nice on my music stand. Thanks for passing it along.